The series of Sitra Trends articles looks at each of the topics on the Sitra Trend List, published in the late autumn, one by one and from different points of view. This article is the second in the series. All published articles can be found at the bottom of the page. Sensors, measuring devices, and genomics are making their way into health with the same kind of determination as mobile phones made their way into communication. Those within the healthcare system should, therefore, seriously think about what people do with the information on their health and well-being they gather themselves, and how it affects their behaviour. Having some of the patients’ data in personal health accounts would enable better diagnostics and the more efficient prevention of illnesses. The healthcare industry should prepare to use more effectively people’s own measurements of their vital functions as a part of patient data. The future is strongly characterised by the thought that new technology will allow fewer of us to become sick in the first place. We are moving from the treatment of illnesses to the promotion of health, and at the same time, those who get sick can get better treatment at an earlier stage. Human suffering will decrease, and healthcare can be made significantly more effective. Well-being and health are among the most important application areas for sensors and other electronic devices which monitor peoples’ basic vital functions. For instance, it is already possible to monitor one’s own blood pressure, pulse, and blood sugar values with electronic measuring devices. In the future, a sensor connected wirelessly to one’s clothing or body will transfer its measuring data to one’s mobile phone, notify if there are any anomalies in one’s cells or heart functions, and even administer a medication. We will also not have to worry about whether we are tired or stressed, because, if we wish, the advanced sensors will let us know. Devices can already be used for a preliminary diagnosis, and it is not always necessary to see a doctor. Genomics is an entirely different chapter. It is already making its way towards the prevention of illnesses. I had my own genes mapped a couple of months ago. The mapping was based on a saliva sample which was then analysed. I ran my DNA raw data through interpretation software, and lo and behold, all my health information was right there before my eyes. I received raw information which I could use to determine the relative risk of my contracting different illnesses. The data revealed exactly what I had thought: I, like many other Finns, had a clearly higher than average risk of getting cardiovascular diseases. I also didn’t like my rather high level of hereditary susceptibility to developing Crohn’s disease, a rather unpleasant intestinal illness. Furthermore, certain medicinal substances will most likely have no effect on me, which was totally new information for me. The data also included an analysis of the risk factors for different kinds of cancer. The unpleasant data, however, culminated in the fact that I have the hereditary gene for a long life. So there is hope, as long as my heart doesn’t give out! The suggestive risk factor data I had before me brought about a lot of thoughts. The first was that everyone should be able to receive this kind of information. That’s how essential this basic information on your well-being and health is. Second, I started pondering on my own way of life, which I found to be generally correct. I also remembered my workaholic father, who suffered a serious coronary thrombosis at the age of 57, which took his life a few years later. Would my father have lived differently if he’d had access to the same information I now do? And where would I get more information on the illnesses to which I had an increased hereditary susceptibility? It was time to go online and start digging. 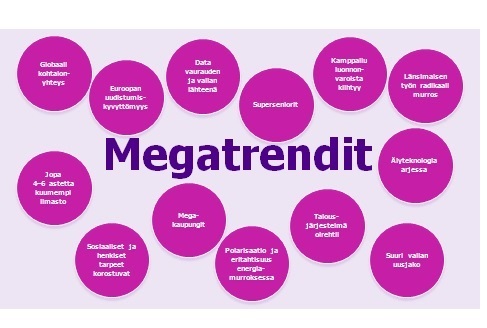 If I did what most Finns do, my first sources are Google and the more sophisticated Terveyskirjasto (Finnish online health library). There is a lot of information on illnesses to be found, but for interpretation and patient experiences you have to rely on discussion forums. I wasn’t very happy with the information I found: the information was clearly not targeted at me, but instead at medical professionals. Who should I turn to, then, to discuss my risk factors? I’m used to only going to see a doctor when I feel ill. But I was not ill, I was just interested in maintaining and improving my health. Fortunately, I have acquaintances to whom I can turn for advice. Many people don’t, however. There is a need for the interpretation of DNA data and for turning it into health and lifestyle information. The need for services will increase as the gene tests become more common, because already now, anybody can test their own genes online. One of the reasons the tests have become more common is the dramatic price drop in recent years. They have also become accessible for regular consumers via the internet. I was able to get the information on my health risks by taking a test for less than 200 euros. In Finland, DNA information is rarely used in healthcare, mostly when starting cancer medications. However, the tests are justifiable, because according to experts, only about half of all patients nowadays benefit from the medication they are given. If the gene tests became more common, less ineffective medication would be used, fewer injurious effects would be created and less unnecessary healthcare would be administered. The people in the risk groups could be identified in time, and preventive measures could be started right away. The Institute for Molecular Medicine in Finland (FIMM) has calculated that by analysing hereditary risk factors, approximately 400 latent cardiovascular cases could be found. In addition to the benefit for the individual patients, these finds would save public funds, too. If the gene testing were to be used as a preventive tool in healthcare, the yearly savings would amount to approximately 10 million euros from cardiovascular diseases alone. According to some estimates from the United States, the yearly savings would be as much as a billion dollars, if the anticoagulant therapy was started earlier with the starting doses forecast by the gene test. According to another research study from France, the use of genetics research in healthcare decreased the costs of breast cancer treatment by 36 per cent, and in the treatment of cardiovascular diseases the savings were as high as 46 per cent. Personal healthcare helped me get to know myself better and gave me a better understanding of how I could live a more beneficial life. I will keep the gene data as a part of my health and well-being information. I also want to be the one to decide with whom I share my information. The confidentiality of this information is important to me. I would not take the test if it were possible, for instance, for insurance companies to use my DNA information in determining my insurance terms. I hope more Finns get the chance to get to learn about their hereditary risk factors in a confidential and effortless way, if they wish to. We have an excellent basis for this, for top-level genetics research has been done in Finland for years. Our nimble neighbouring country, Estonia, has already started measures to make gene tests a part of the national healthcare routine by the year 2020. It is not a question of whether to allow gene tests or not, because people are already taking them anyway. The real question is whether we are prepared to face the legal and ethical questions related to these tests. With the fast development of genome information, Finland could use a national strategy to secure the equitable treatment of its citizens. Sitra is prepared to participate in preparing a strategy that promotes the well-being of all Finns. The gene tests provide information on our genotype, but they do not reveal the whole truth about our health. However, our genotype dictates a third of what leads to our health, or to put it bluntly, our death. Environmental factors and lifestyle dictate a part of it, as does pure chance. Information on hereditary risk factors helps us live a longer and more healthy life, if that’s what we want. At the end of the day, the reason we pass away is a mere guess. New technology, interwoven into our everyday lives, can, however, help us live a much better and healthier life. Tuula Tiihonen is Sitra’s director in the Well-being from Information key area.